MARCH 17, 2019: "ALL DAY NATIONAL TEACH-IN FROM CANADIANS FOR THE RULE OF LAW"
Many Canadians seek to better understand what are their rights in law and how these rights and free speech itself can be understood and protected. There are organizations and “political tribes” that threaten the Rule of Law in Canada. This national Teach-In program featured extensive, in-depth and sensitive content about who those disruptors are, the threats they pose to traditional respect for the rule of law, and how new measures can be taken by law-abiding Canadians to address these threats. February 28, 2019: "SALLY ZERKER - JEWISH LEGAL AND INDIGENOUS RIGHT TO THE LAND OF ISRAEL"
What are Israel’s Legal and Indigenous Rights? Those who could answer only one part of the above question or neither aspect were presented with a great learning opportunity with Professor Sally Zerker. Her presentation confirmed the facts, helped arm attendees to defend Israel, and expanded their network of support. Participants were encouraged to be part of the solution when confronting anti-Zionism, which is antisemitism. December 4, 2018:"DR. MARTIN SHERMAN - NEW SOLUTIONS TO OLD PROBLEMS: ISRAEL'S GEOGRAPHIC AND DEMOGRAPHIC REALITY"
December 6, 2018: "DR. MARTIN SHERMAN - ISRAEL'S STARK OPTION - ARABS IN GAZA OR JEWS IN THE NEGEV"
Dr. Martin Sherman, Founder and CEO of the Israel Institute for Strategic Studies, one of the foremost “intellectual warriors” of Israel, visited Toronto to speak on a range of topics of current interests to supporters of Israel: Jews – Owners or Occupiers – What about Judea & Samaria? ; The Demographic & Geographic Imperatives Facing Israel; Nationalism vs. Globalism – Is the Concept of a Nation State Passé? Video from the December 4th Evening Lecture is available here. February 18, 2018: "MELANIE PHILLIPS - NO LIBERTY, NO EQUALITY, NO FRATERNITY: DEALING WITH THE FAILURE OF THE WEST"
February 20, 2018: "MELANIE PHILLIPS - THE WORLD TURNED UPSIDE DOWN: THE ROLE OF THE MEDIA"
On February 18, 2018, The Speakers Action Group presented Melanie Phillips at Holy Blossom Temple with her talk entitled “No Liberty, No Equality, No Fraternity: Dealing with the Failure of the West”. Video is available from the Evening Lecture here. Then on February 20, 2018, a Business Lunch Lecture was presented, "The World Turned Upside Down: The Role of the Media". Video from the Business Lunch lecture is available here. May 3, 2018: "DR. JACQUES GAUTHIER - FORGET POLITICS: WHO HAS LEGAL RIGHTS TO JERUSALEM?" Hasbara Fellowships Canada presented Dr. Jacques Gauthier, the Canadian lawyer whose life's work has been devoted to a thesis proving the legitimacy of the Jewish claim to Jerusalem under international law. The event was held at The Dan Family Village Shul, in partnership with Speakers Action Group, The Mozuud Freedom Foundation, Canadians For Balfour 100, and Canadians For Israel's Legal Rights. Video of the lecture is available here. March 26, 2018: "THE FIGHT OF OUR LIVES - SPECIAL FILM SCREENING"
Award-winning director/producer Gloria Greenfield introduced her fourth documentary, The Fight of Our Lives: Defeating the Ideological War Against the West, with the warning, “Civilizations, empires, great powers can fall apart very fast. Collapse can come suddenly like a thief in the night.” A post-screening Q&A was held with Gloria Greenfield. June 12, 2017: "A VEIL OF DENIAL: JUSTICE, RIGHTS, CULTURAL APPROPRIATION"
Special Guest Nitsana Darshan-Leitner of Shurat Hadin Israel Law Center joined our powerful expert panel with Raheel Raza and Christine Williams in conversation about the serious issues of a world in denial of victims of terrorism, Motion M-103 and Islamophobia, and The Balfour Declaration. May 18, 2017: "THE BALFOUR DECLARATION: ITS SIGNIFICANCE FOR CHRISTIAN, MUSLIM, JEW"
We welcomed Dr. Jordan Peterson, Salim Mansur, and Ezra Levant as they explored the significance of this very important British document. This event was sponsored by Canadians for Balfour 100, a project of the Speakers Action Group, in cooperation with The Council for Muslims Facing Tomorrow and The Mozuud Freedom Foundation. Two videos from the event - the main presentation and the Q&A Period - are now available here! January 22, 2017: "FREEDOM OF SPEECH OR POLITICAL CORRECTNESS"
We welcomed Dr. Jordan Peterson, Dr. Norman Doidge, and moderator Faith Goldy to the North York Civic Centre Council Chambers on January 22, 2017 to explore this very topical issue. Dr. Jordan Peterson has brought to Canada's attention the negative implication of recent laws for free speech, at great cost to himself; Dr. Norman Peterson is a psychiatrist and psychoanalyst best known for his much lauded work and publications on the human brain; and Faith Goldy is a fearless political and social commentator often featured on TheRebel.media. Three videos from the event - Dr. Jordan Peterson's presentation, Dr. Norman Doidge's presentation, and the Q&A Period - are now available here. September 20, 2016: "A CONVERSATION: TRUMP, BREXIT MIGRATION - IS THE WORLD ON FIRE?" Our expert panel of Leo Adler, Aurel Braun, Salim Mansur, Lauren Southern and John Thompson were joined by moderator Dr. Jack Muskat on September 20th, 2016, at Holy Blossom Temple to discuss the balance between individual rights and community interests, maintaining our western culture, and setting aside partisan positions in a candid conversation. Two videos from the event - the main conversation and the Q&A - are now available here. April 18, 2016: "FORECAST FOR FREEDOM IN THE MIDDLE EAST"
Gregg Roman, the CEO and Director of The Middle East Forum, gave a thoughtful and insightful analysis of the challenges presented by different countries in the Middle East and the possibility of freedom existing or lack thereof, especially in Syria and Iraq where the presence of ISIS makes the concept of Freedom a distant dream - on April 18th, 2016, at Beth Tikvah Synagogue with the expert panel of Rabbi Jarod Grover, Geoffrey Clarfield, and Sara Akrami, moderated by Miles Smit. Three videos from the evening are now available here - the main lecture, the expert panel, and the Q&A. December 1, 2015: "HOW CIVILIZATIONS DIE: IMPLICATIONS FOR EUROPE AND THE MIDDLE EAST"
David P. Goldman, aka Spengler, brought his fascinating message to Toronto on December 1st, with a lunch lecture at Blaney McMurtry LLP followed by an evening lecture at The Dan Family Community Centre. Video from the evening lecture is now available here. October 26, 2015: "BODY AND SOUL - THE STATE OF THE JEWISH NATION"
We held another showing of this amazing documentary at Beth Tikvah Synagogue on Monday, October 26, 2015. Through expert commentary, this film not only shows the undeniable historical connection between the Jewish People and the Land of Israel, but also succeeds in debunking the propaganda, myths and misinformation that have become deeply entrenched in public discourse. There was a post-screening discussion with Producer/Director Gloria Greenfield. August 24, 2015: "THE IRAN DEAL: PATHWAY TO A NUKE"
Our recent event on August 24 was held at Beth Tikvah, and featured Mark Dubowitz, the Executive Director of the Foundation for Defense of Democracies, a Washington, D.C.-based non-partisan policy Institute. Click here for the full video from the event. April 30, 2015: "A CONVERSATION: "BALANCING LIBERTY AND SECURITY IN A CIVIL SOCIETY"
our recent event on April 30 was a resounding success, held at the Council Chambers of North York Civic Centre. The panellists and moderator set the mood reacting to Madam Louise Vincent stating, “…had Bill C-51 existed, her brother would still be alive…” Click here for the full video from the event. 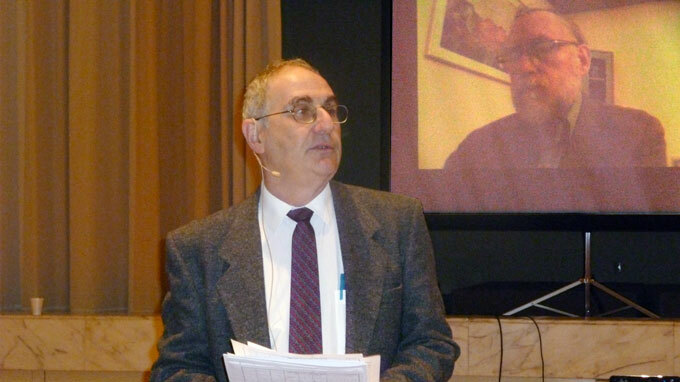 February 22, 2015: "MAKING SENSE OF THE ELECTIONS IN ISRAEL"
Featuring speaker Prof. Reuven Hazan, this was a special Skype Event presented in partnership with CFHU and Beth Tikvah Synagogue on Sunday, February 22. Click here for the Canadian Jewish News article covering the event. January 22, 2015: "CANADA AT RISK" and "ISRAEL IN A TURBULENT MIDDLE EAST"
Featured speaker Dr. Mordechai Kedar, with afternoon and evening sessions being held on January 22, 2015. The afternoon session had live music, great food, an expert panel, and Dr. Kedar, while the evening lecture spotlighted Dr. Kedar and his insights. Click here for videos of the main lecture and the panelists and Q&A session from Israel In A Turbulent Middle East. November 12, 2014: "BODY AND SOUL - THE STATE OF THE JEWISH NATION"
This insightful documentary screened on Wednesday, November 12, 2014. Although including stalwart defenders of Israel, it also presented a very diverse and human face and an uplifting tone while establishing the link between Judaism and the land along lines of historical, cultural and political continuity through serious-minded documentation. There was a post-screening reception with the producer/director Gloria Greenfeld. Click here to read the Times of Israel essay on the importance of this film by Geoffrey Clarfield. June 2, 2014: "THE J STREET CHALLENGE"
is a fascinating documentary that was screened at Beth Tikvah on June 2, 2014, and featured an excellent panel of experts who discussed the film and answered questions afterwards. Geoffrey Clarfield wrote a review of the screening and the event for The Times of Israel. Click here for the full story. Canadian experts (Dr. Judith Cohen, John Thompson and Irving Weisdorf) who answered questions from the audience. The film was produced by Charles Jacobs, an American from the Boston area who is well known in anti slavery activist circles in the North East and the United States. The film comprises generous clips of speeches by J Street director Jeremy Ben-Ami, his supporters and critics, most notably lawyer Alan Dershowitz and Harvard Professor Ruth Wisse, who eloquently and consistently point out what is wrong with the organization." Click here for the full story. April 23rd and 24th, 2014: "EXPOSING MEDIA MYTHS: Death, Lies and Videotape"
Featuring speaker Philippe Karsenty, French media analyst, who dared to expose the truth in reporting the al Dura myth which led to a fine of $40,000 and a long battle in the French Courts, this event was held on April 23rd and 24th, 2014 in both an evening lecture and breakfast lecture format. Click here for videos of the main lecture and the Q&A session. January 31, 2014: "WHEN THE DUST SETTLES IN DAMASCUS: New Realities of The Middle East"
Featuring speaker Dr. Jonathan Spyer, Middle East analyst focusing on Syria, Lebanon and Israeli strategic affairs, senior research fellow at the Global Research in International Affairs Center in Herzliya, author and journalist, and frequent guest analyst on electronic media, this even twas held on January 31st, 2014 at Bennett Jones LLP. Click here for videos of the main lecture and the Q&A session. October 24, 2013: "A CONVERSATION: Quebec's Charter of Values"
Our event on October 24, 2013 was exceptionally topical and affects us all - with featured speakers Rabbi Jarrod Grover, Senior Rabbi, Beth Tikvah Synagogue, & Dr. Salim Mansur, Professor of Political Science, Western University. , as they engaged the topical issues around Quebec's recent conflicts concerning the separation of religion and state and its impact on individual faiths and traditions. Click Videos to watch the main conversation and the following Q&A session. June 19, 2013: "INSIDE IRAN'S ATOMIC WARHEAD: Tehran's Plan To Nuke Israel - Step-By-Step"
Our previous event on June 19th featured Edwin Black, award-winning international investigative author and talk show host, expect in technology and in its political and historical implications, with his dynamic talk on Iran’s development of nuclear weapons. The main lecture and the Q&A session videos are available for viewing by clicking here. May 21, 2013: "ALARMING TRUTHS: Subversion and Security Threats To Our Society"
Speaker: Clare Lopez, talking about home-grown terrorists in Canada - who is putting them up to this and how is it being done? Please click here to read the Blog Wrath article on the event, "ISLAMIC JIHAD AND WESTERN SILENCE (A LECTURE BY CLARE LOPEZ)". Apr. 25, 2013: "A SEA OF TROUBLES: The Current Disarray in the Middle East"
Speaker: Emanuele Ottolenghi, Senior Fellow at the Foundation for Defence of Democracies. Two videos are available from that fascinating evening - his main talk and the following Q&A. Click here to view those videos. Jan. 27, 2013: "POST-ELECTION ISRAEL: in a Dangerous and Turbulent World"
Our January 27, 2013 event with Dr. Mordechai Kedar, distinguished scholar of Arabic literature, lecturer at Bar Ilan U in Israel talking about the recent elections in Israel proved very successful in analysing and providing an explanation for the unexpected voting pattern results in Israel. You can watch the videos here: the first video is his lecture and the second, the Q and A – the latter is interesting in explaining why Israelis were more interested in their social needs than security...for this event we partnered with CIJR and Temple Sinai. Nov. 22, 2012: "MIDDLE EAST REFUGEES: Facts and Fiction"
Our previous event, a business lunch lecture on Thursday November 22 with Dr. Stanley Urman from New York (below), Executive Vice President and Co-founder of New York based Justice for Jews from Arab Countries, was very successful and well-attended with a very active Q and A. Dr. Urman discussed the serious issue of mass violations of human rights, persecution and violence against over 800,000 Jews who were expelled from their homes in Arab countries and Iran after 1947. There were Jewish refugees as well as the Palestinian refugees created in the Middle East which has been ignored by the international community. The Mandate of JJAC is "to ensure that justice for Jews displaced from Arab countries assumes its rightful place on the international agenda and that their rights be secured as a measure of law and equity". View some video of his talk at our Business Lunch Lecture series. Oct. 29, 2012: "US ELECTIONS: Implications For The Future of The Middle East"
Featuring Prof. Barry Rubin, Middle East expert, Director of the GLORIA CENTER author of over 23 books and much more, speaking to us from Israel, and introduced by Lawrence Solomon, pictured below. Sept. 10, 2012: "THE ASSAULT ON CIVILIZATION: The Threats Both Within and Beyond the City Walls"
Featuring speaker Bill Whittle, creator of popular on-line Internet video series, FIREWALL and AFTERBURNER, was well attended and greeted with much enthusiasm. His talk can be viewed on our video page of the event. May 16, 2012: "THE ASSAULT ON WESTERN VALUES: The Media, Anti-Semitism and Other Gnawing Threats"
February 8, 2012: "THE MIDDLE EAST BETWEEN A ROCK AND A HARD PLACE: Iran, Syria, Egypt and Turkey"
June 17, 2011: "TURMOIL IN THE MIDDLE EAST: What is Really Happening"
April 7, 2011: "THE NEW NEIGHBOURHOOD: Israel's Security Challenges"
March 11, 2011: "Israeli Apartheid is a Lie"
November 7, 2010: "From Kristallnacht to Liberation"
November 3, 2010: "Review of Ellie Wiesel's book The Forgotten"
October 13, 2010: "The Campus War Against Israel"
October 4, 2010: "Holocaust by Bullets"
July 6, 2010: "Know Thy Enemy - After The Flotilla"
April 29, 2010: "Seeking Peaceful Coexistence in the Middle East"
March 16, 2010: "THE IRANIAN THREAT: Global Terrorism and Nuclear Weapons"
February 9, 2010: A Former Muslim Extremist Speaks Out - "JIHAD MYTHS AND REALITIES"
This was an enlightening talk by featured speaker Dr. Tawfik Hamid, Senior Fellow & Chair For The Study of Islamic Radicalism at the Potomic Institute for Policy Studies, an event which was held at Beth Tzedec, and moderated by Johnathan Kay from the National Post. The video from this event is now available - click here to watch. January 27, 2010: "Antisemitism on Campus"
Guest Speaker: Marina Nemat, Author, "Prisoner Of Tehran"
December 7, 2009: "Israel...Facing Crucial Decisions"
November 10, 2009: "Antisemitism Then and Now... a Survivor's Perspective"
November 5, 2009: "Nazi Media and Propaganda...How Did It Persuade German Youth?" November 3, 2009: "Lies Used As Weapons...Does Law Offer A Remedy?" June 17, 2009: "Jerusalem's Sovereignty...Myth to Fact"
April 29, 2009: "Law in a Diverse Society: Working With Disempowered Communities in a Multicultural Nation"
April 19, 2009: "The Case for Israel - Democracy's Outpost"
A film by Alan Dershowitz. March 26, 2009: "Israel in the News...A War of Ideas"
March 10, 2009: "Iran, Israel and the U.S. - New Administrations, Old Challenges"
February 12, 2009: "Accommodation or Intimidation?" January 21, 2009: "Defending Freedom on Canadian Campuses"
November 26, 2008: "Election Update: Israel And The U.S. - New Realities"
November 17, 2008: "The Cairo Genizah: Medieval History Revealed"
November 3, 2008: "The Psychology of Hate Propaganda"
September 25, 2008: "Human Rights Commissions: Censorship or Protection?" September 18, 2008: "The Durban II Nightmare"
June 16, 2008 "Freedom of Speech"
Moderator: Marni Soupcoff, National Post. April 23, 2008: "The Law and Human Rights...21st Century Challenges"
Speaker: The Honourable Irwin Cotler, MP. Moderator: The Rev. Dr. Karen Hamilton, Canadian Council of Churches. April 1, 2008: "Human Rights Under Siege... What Should Canada Do?" Speakers: Dr. Payam Akhavan, McGill University; Jonathan Kay, National Post. February 21, 2008: "Defending Freedom on Canadian Campuses"
Speaker: Dr. Aurel Braun, University of Toronto. February 6, 2008: "Hinduphobia and Antisemitism: Common Issues"
November 22, 2007: "Truth and Consequences... Media's Impact on Public Opinion"
September 19, 2007: "The Threat of Terrorism in Canada and its Legal Implications"
Speakers: John Thompson, Mackenzie Institute; Stewart Bell, National Post; David Harris, prominent attorney. We would be happy to develop an effective speaking event or lecture series, tailored to your specific professional interests.